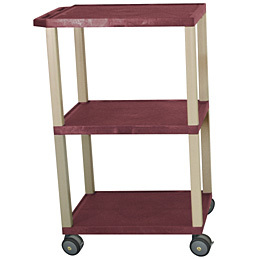 3 shelf 42 1/2 inch height mobile plastic rolling utility (service) cart with 200 lb capacity. Made of injection molded engineered thermoplastic resin. 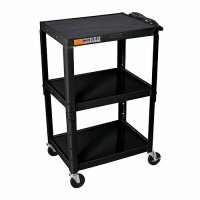 Will not chip, warp, crack, rust, or peel. 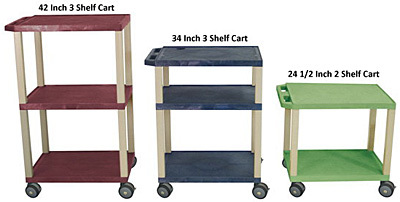 This Tuffy cart is one of the the top selling carts in the line of H.Wison products. Dimensions: 18 inch depth x 24 inch width x 42 1/2 inch height. Shelves are 1 1/2 inch thick. Legs are 1 1/2 inch square. 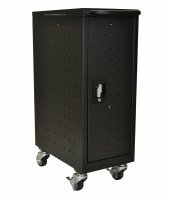 All shelves have a 1/4 inch safety retaining lip and a raised texture surface to enhance product placement and ensure minimal sliding.